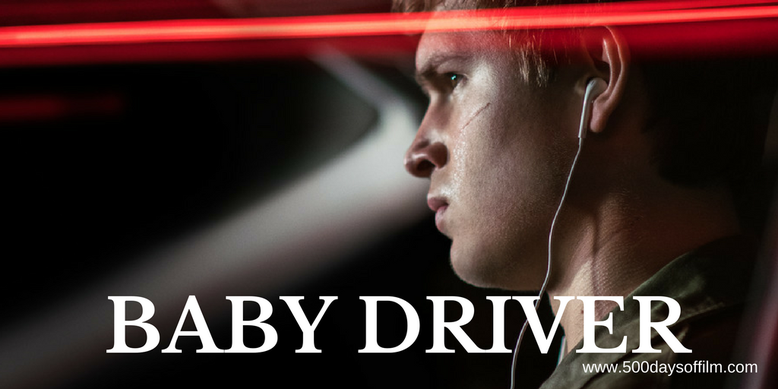 Baby (Ansel Elgort) is a talented, young getaway driver who relies on the beat of his personal soundtrack to be the best in the game and to cope with tinnitus. When he meets Debora (Lily James), the girl of his dreams, he sees a chance to leave a life of crime and make a fresh start. However, getting away from crime boss, Doc (Kevin Spacey), will not be easy. Edgar Wright’s Baby Driver starts as it means to go on - with a stunningly choreographed car chase set to music from Baby's eclectic playlist. This opening sequence is an adrenaline igniting, pulse racing feast for both the eyes and ears. Baby has preternatural driving skills. Like a petrol fueled chess player, he is always several moves ahead of anyone else on the road. However, these opening sequences (and the wonderful coffee and credits scene that follows) are also a showcase for other outstanding gifts - that of movie direction and editing. Baby Driver is not a crime drama set to music, it is a film with music at its heart and a beat pulsing through its veins. Wright’s direction and his flim's editing (by Paul Machliss and Jonathan Amos) are phenomenal. Every key move is accompanied by the diegetic sound of 2017's most exciting and impressive soundtrack. Of course, in lesser hands, this could have become an unwieldy gimmick. However, the musical concept is expertly managed and our interest sustained by Baby Driver’s gripping story, high octane action, smart humour and utterly charming romance. Again, in lesser hands, Baby himself could have felt more style than substance. This is a tricky character to pull off and make human. Thankfully, Ansel Elgort proves an inspired choice for the role - conveying Baby’s exuberant youth, vulnerability and debilitating feelings of loss. Indeed, the most heinous crime in Baby Driver does not center around the various robberies that take place but involves the theft of Baby’s dreams and potential. He is deeply indebted to Doc and trapped in a life of crime - much to the dismay of his guardian, Joseph (played in poignant scenes by CJ Jones). Baby Driver’s impressive supporting cast further serve to highlight Baby’s terrible predicament. Kevin Spacey is superb as the menacing paternal figure who gets all the best lines and delivers them in typical Spacey style. Meanwhile, Jamie Foxx is brilliantly unpredictable (I’m the one with the mental problems in the group”) and Jon Hamm and Eiza González are monstrously unhinged as Buddy and Darling. Baby’s only possibility of escape comes via a True Romance of sorts. Lily James gives an absolutely charming performance as love interest, Debora. As a result, we are able to root for the young couple. Has the sharing of earbuds ever been more romantic? However, James is not given an awful lot of space to play with. Wright’s film only hints at her past and he doesn’t really give her time to develop into much more than the girl in the passenger seat of Baby’s dreams. As his film moves into its final act, Wright cranks up the Tarantino-esque action violence. In a desperate attempt to escape, Baby has to get his hands dirty (cue some horror-inflected, deliciously gruesome scenes) and finally face the music. It is here that we realise just how invested we are in the outcome of his story. What follows is an exciting, pulse racing cinematic accomplishment from Wright, his cast and crew - and my heart has not stopped racing since. In an interview with Mark Kermode (featured in the July issue of Sight & Sound), Edgar Wright explains that he had the initial idea for Baby Driver all the way back in 1995. He then used the concept in a music video that he directed (Blue Song by Mint Royale) - worrying later that he had burned a great idea for a film. Edgar Wright’s love of movies is evident (if not overly explicit) in Baby Driver. The film offers hints of Risky Business, The Driver, Drive and The Blues Brothers. To coincide with the release of Baby Driver, Wright was asked to curate a season of cinematic car classics (knowingly) called Car Car Land at the BFI in London. In his introduction to this series, Wright explains that “I am a fan of action cinema in its purest form and the best film car chases are some of the most glorious collisions of sound and image in the art form”. Have you seen Baby Driver? If you have, what did you think of Edgar Wright’s film? Let me know in the comments section below or let’s catch up over on Twitter or Facebook!